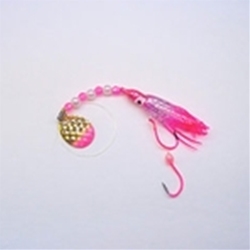 R&K Spinner Hoochies are great for Kokanee, Trout and Coho. Use 8 to 10 inches behind any Dodger. You can also use behind a small set of flashers (14 to 24 inches). With triple barbed colored hooks, scent holding foam in he head, premium beads, bodies and premium leader, threse are considered by many angler's to be one of the best hoochies on the market.